The camera's freedom to move is taken for granted in these days of the Steadicam, the lightweight digital camera, and even special effects that reproduce camera movement. A single unbroken shot can seem to begin with an entire city and end with a detail inside a window -- consider the opening of "Moulin Rouge!" (2001). But the camera did not move so easily in the early days. The cameras employed in the first silent films were lightweight enough to be picked up and carried, but moving them was problematic because they were attached to the cameraman, who was cranking them by hand. Camera movement was rare; the camera would pan from a fixed position. Then came tracking shots -- the camera literally mounted on rails, so that it could be moved along parallel to the action. But a camera that was apparently weightless, that could fly, that could move through physical barriers -- that kind of dreamlike freedom had to wait until almost the last days of silent films. And then, when the talkies came and noisy sound cameras had to be sealed in soundproof booths, it was lost again for several years. F.W. Murnau's "Sunrise" (1928) conquered time and gravity with a freedom that was startling to its first audiences. To see it today is to be astonished by the boldness of its visual experimentation. Murnau was one of the greatest of the German expressionists; his "Nosferatu" (1922) invented the vampire movie, and his "The Last Laugh" (1924) became famous for doing away altogether with intertitles and telling the story entirely with images. Summoned to the United States by William Fox to make a film for his new studio, Murnau worked with the cinematographers Charles Rosher and Karl Struss to achieve an extraordinary stylistic breakthrough. The Murnau admirer Todd Ludy wrote: "The motion picture camera -- for so long tethered by sheer bulk and naiveté -- had with 'Sunrise' finally learned to fly." The film was released at the very moment when silent films were giving way to sound; "The Jazz Singer" was already making its way into theaters. Murnau's film actually had a soundtrack, avoiding dialogue but using music and sound effects in sync with the action. By the next year, audiences would want to hear the actors speaking, and that led to an era of static compositions and talking heads, unforgettably lampooned in "Singin' in the Rain." Released in what Peter Bogdanovich calls the greatest year in Hollywood history, when silent films reached perfection and then disappeared, "Sunrise" was not a box-office success, but the industry knew it was looking at a masterpiece. When the first Academy Awards were held, the top prize was shared: "Wings" won for "best production," and "Sunrise" won for "best unique and artistic picture." Its story can be told in a few words. It is a fable, denying the characters even names; the key players are The Man (George O'Brien), The Wife (Janet Gaynor, also an Oscar winner that year), and The Woman from the City (Margaret Livingston). In a quaint lakeside village, the city woman has come for a holiday, and lingered on to seduce and entrap the man. In a remarkable early sequence, we see her smoking in her room, prowling restlessly in lingerie, and then walking through the village to the lighted window of the man's cottage, where she whistles (there is a low and ominous musical note on the soundtrack). Inside the cottage, the man hears her, we see torment and temptation in his face, and finally he slips out of the cottage; when his wife returns to the table with their dinner, he is gone, and the movie juxtaposes her embracing their child and the woman from the city embracing him. But look at the shot that shows the man and the city woman slipping off into a foggy marsh area. Although the ground is muddy and uneven, the camera seems to glide smoothly along with them, pushing through shrubbery, following their progress, finally watching them embrace beneath a full moon. I've seen "Sunrise" several times and always noted this shot without quite realizing how impossible it was. Now I have had it explained. The commentary track on the 20th Century-Fox DVD is by the gifted cinematographer John Bailey, who is a student of early camera techniques and a particular admirer of Struss. He explains that the marsh is a studio set, that the sky and the moon are actually quite close, and that the camera platform is suspended from overhead cables so that it glides behind them as they push through the mud and the shrubbery. If the poetry of this scene is haunting, listen to Bailey as he analyzes some of the famous later scenes, including two boat trips across the lake and a fantastical interlude in the city on the other shore. He has the gift, rare among experts, of explaining his art with such love and clarity that everyone can understand; he uses the writings of Struss, still photos taken on the set, and above all his own instinct and experience to explain how extraordinary shots were created. Many of the best moments involve superimposed images. At one point, we see the man being enveloped by two ghostly images of the woman from the city. We see a train passing in the foreground while extras walk in the middle distance, and the city rises in the background. We see a frenzied nightclub scene, musicians on the left, dancers in the center, all seeming to float in a void. These shots, Bailey explains, were created in the camera. It was an era before optical printers, let alone computers; the camera operators masked part of the film, exposed the rest, then masked the those portions and exposed what remained. Meticulous control of the lens and the counting of individual frames was necessary. In addition, they were made of different kinds of reality; the train was a model which looked large in the foreground, the extras were real, the city was a form of matte drawing. As I listened to Bailey, it occurred to me that the best commentary tracks are often by experts who did not work on the film but love it and have given it a lot of thought. They're more useful than those rambling tracks where directors (notoriously shy about explaining their techniques or purposes) reminisce about the weather on the set that day. 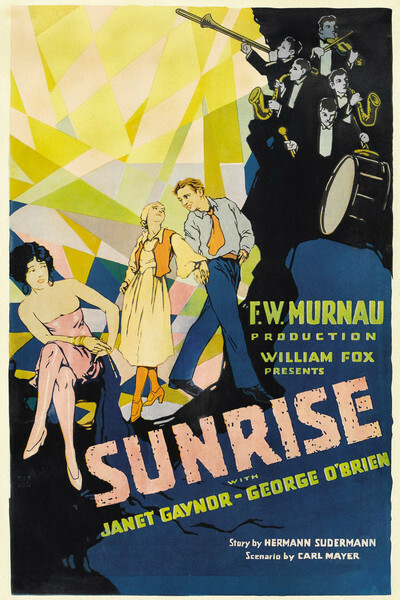 The power of "Sunrise" comes precisely through its visual images, and Bailey makes a good case that Struss, who got second billing after Charles Rosher, made the key contribution. He had purchased his own camera, powered by an electric motor, which set it free to glide through space and give "Sunrise" its peculiar dreamlike quality. And he devised techniques to create some of the effects; looking at stills taken on the set, Bailey takes hints from such details as a black back cloth that was used to obscure part of an image so it could be replaced with another. The story, as I said, is very simple, but it has power. The woman from the city persuades the man to drown his wife so they can run away together. The film has few titles, but they are dramatic: the word "drown" swims into view and then appears to run down the screen and disappear. As the man and his wife begin their boat journey across the lake, Bailey notes that the camera always regards him from a high angle, even when he is towering over his wife and the natural angle would have him looking down at the camera. This strategy keeps him subservient to the camera and emphasizes the pressure he's under; and Murnau underlines his tortured psychological state by making the actor, O'Brien, wear shoes with lead weights in them, so that he steps slowly and reluctantly. He does not after all drown his wife. In the city, which is constructed from fanciful sets that suggest the "city of the future" often seen in silent films, the man and wife fall back in love -- and then, as they return across the lake, a tempest overturns the boat and it appears she may have been drowned by chance. It's very broad melodrama, and the realism of spoken dialogue would have made it impossible. But silent films were more dreamlike, and Murnau was a genius at evoking odd, disturbing images and juxtapositions that created a nightmare state. Because the characters are simple, they take on a kind of moral clarity, and their choices are magnified into fundamental decisions of life and death. I imagine it is possible to see "Sunrise" for the first time and think it simplistic; to be amused that the academy could have honored it. But silent films had a language of their own; they aimed for the emotions, not the mind, and the best of them wanted to be, not a story, but an experience. Murnau, raised in the dark shadows of expressionism, pushed his images as far as he could, forced them upon us, haunted us with them. The more you consider "Sunrise" the deeper it becomes -- not because the story grows any more subtle, but because you realize the real subject is the horror beneath the surface. F.W. Murnau's "Nosferatu" and "The Last Laugh" are also in the Great Movies collection at www.suntimes.com/ebert/greatmovies/.